With all the projects now complete, it was time to see if everything actually worked. On the 28/12/2015 around 6pm, I hastily prepared for a short expedition to Mount Rumney, which was near home. 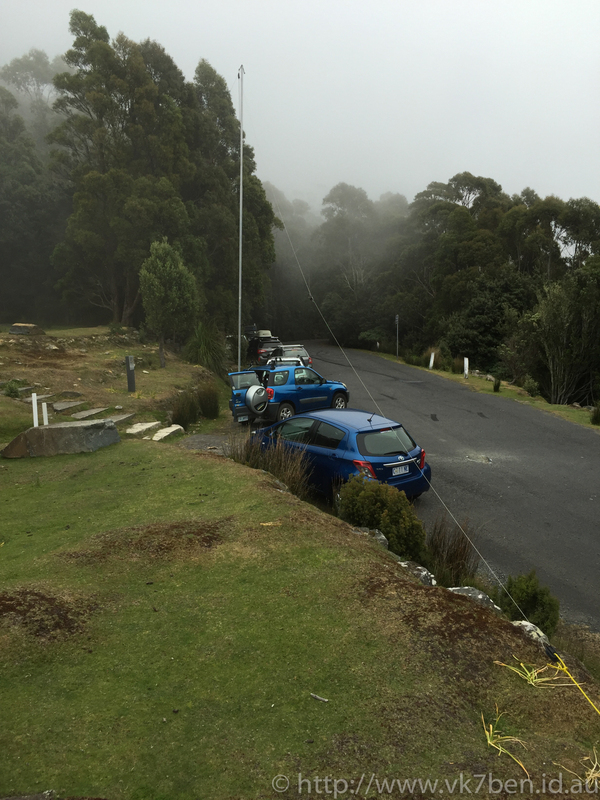 At an elevation of 350m ASL, it provides a great take off for radio signals, though I did discover that is was rather difficult to locate my car in a position that would allow me to raise the dipole antenna in a way that did not interfere with the public carpark or road much. What i did find was that it was much better received signals than my home QTH, which is in the saddle of two hills and as an elevation of 20m ASL. A lot more stations were heard, and many of them Signal Strength 5 or greater on 20m, with 15m also with many stations heard (for reference, my home QTH it is rare to hear anything on 15m, and rare to hear anything on 20m greater than S3). In the limited time I had up there (less than 1 hour operating), I only made 1 contact with ZL90IARU, but was quite content listening to all the activity on the bands I hadn’t heard before. Another issue discovered that the feed line I has was not what I thought it was! being second hand and having the right connectors on it I didn’t think too much about the quality until RF started getting into everything when I transmitted. Investigation found that the shielding was almost non existent, with very little braid shield and mostly foil. That feed line is now in the bin and a new feed line is in place. On Friday I decided to get one of my new year’s resolutions done early and take my station portable, ideally somewhere high. After test runs at Mt Rumney and at the REAST clubrooms, I packed my car and headed to The Springs on Mt Wellington. I was not quite expecting the crowds of people at the parking spaces just off Pinnacle Road and ended up relocating to the site of the Springs Hotel. Again, the most difficult part was finding a suitable space to set up because there were so many cars. With the lack of wind at the site, I was able to raise the 9m mobile mast without needing guy wires and was QRV on HF around 3.30pm local time using a trapped dipole as the antenna. Despite the 650m elevation working conditions were quite difficult, with auroral activity during the day causing depressed conditions along with strong static crashes due to storms in northern Victoria. Mostly working on 40m, contacts were made into VK2 and VK3 with many of those stations performing SOTA activations. I also worked Graham VK7ZGK and a VK5 station. Finally, only 2 DX contacts, ZL1BHC and K5MVP just before I went QRT around 7.40pm local. Another fun aspect of the portable station was watching other mountain visitors swing around the corner in their cars and then crane their necks upwards at the mast as they drove past. I also had several bemused bushwalkers come up to me to have a chat about what I was up to and I think a couple are now considering on dropping by the clubrooms on a Wednesday for more information. 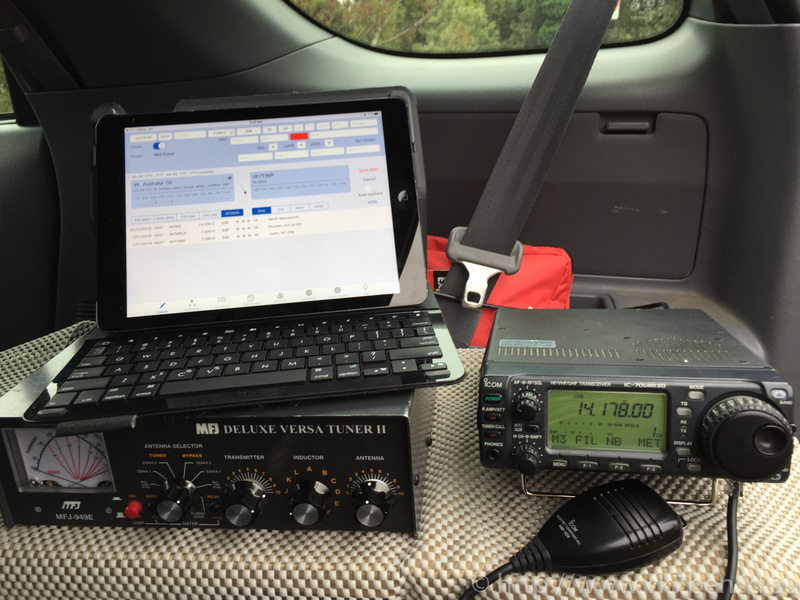 I can easily see why SOTA can become so addictive having now operated my portable station, but the configuration that the car provides is much more convenient to do longer operations with. Nice setup. 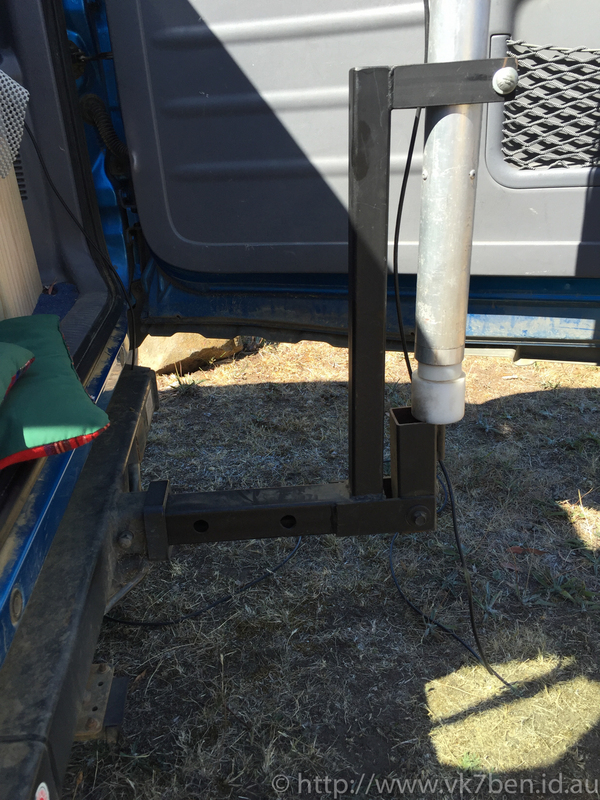 I plan to add a trailer hitch to my Jeep in 2016 and have a similar setup when I operate from local parks. I also find that when I operate from parks that I receive much better than from my home which has a high noise level.